God does not promise a smooth flight only a safe landing. 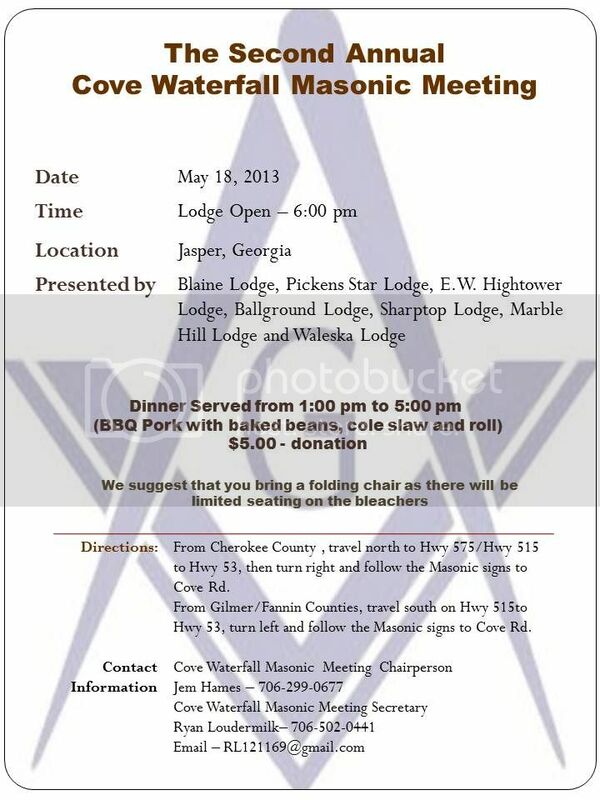 This Saturday October 27, Hickory Flat Lodge #205 is haveing their 21st Annual BBQ 11:00am-3:00pm. the location is 2907 East Cherokee Drive Canton Ga., about 1/8 of a mile south of 140, (just look for the signs). just wanted to check in and see hows everyone doing. Campbellton lodge #76 will be having its annual turkey shoot this Saturday November 17. Come by and see our historical lodge that we have been meeting in since 1848 and bring your 12 or 16 gauge and shoot for a turkey, or use one of ours. Send me a pm with any questions. "Nobody has more fun than people"
I am not, but I have two very interesting books on the subject - World's Wonder or Freemasonry Unmasked (1835) and The History of Freemasonry Vol I (1889). They are so old I'm afraid to read them! I have no idea how Ive missed this thread for so long. Here is a flyer for an upcoming meeting I would like to invite the Brethren from GON to. Are you fellows reading this thread ? Hope yall are reading and responding. Please add me to the list. I have traveled a bit. Carter Hill #268.